When’s the last time you lost control and shook your body to the beat? If it’s longer than you’d care to admit, don’t fret. 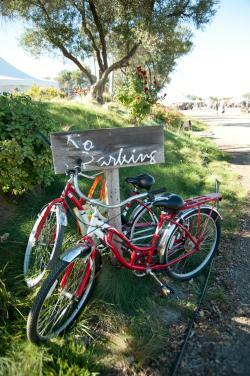 SLO CAL is home to some of the coolest music venues around: wineries! 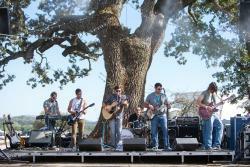 Tooth and Nail Winery in Paso Robles hosts local musicians as well as well-known artists year-round. Cozy up to the castle, grab a delicious bite and glass of wine and groove the night away. Don&apos;t forget to check the Vina Robles Amphitheatre schedule for everything from Alice in Chains, comedian Trevor Noah and The Brothers Osborne to Tony Bennet, Jackson Brown and so many others. 2. Two Words. Nom nom! Seeking a foodie-approved lunch? You don’t have to leave the wine trail for that. Cass Winery in Paso Robles offers up beefy burgers sourced from homegrown cattle, bacon sizzled over spent syrah vines, and killer salads, sandwiches, and cheese and meat plates, too. The best part? The ambiance is totally casual! Pull up a chair inside or on the patio and bring your buds along for a satisfying afternoon. Did we mention that the wine tasting staff bring the tasting list to you? Justin Winery in Paso Robles is home to an award-winning restaurant known for plating farm fresh ingredients (plus herbs are often pulled from an onsite chef’s garden). Reserve a quiet and romantic dinner for two and watch the sparks fly. 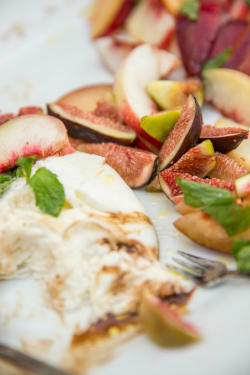 Tolosa Winery in SLO wants you to leave full and happy—not to mention, educated. Swing by their elegant tasting room this summer, where the winery’s boutique pinot noir is always paired to expert perfection. Mark your calendar for Pinot and Paella on September 23 and Wine and Cheese on October 14. We’re stuffed! A nap is in order. Even if you’re on vacation with the kids, you can still experience fantastic wines and top-notch wine country hospitality. 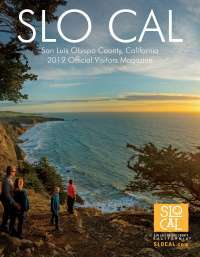 SLO CAL is all about family-friendly inclusiveness and a relaxing rural vibe that encourages everyone to stretch their legs and hit the reset button. Talley Vineyards is the place to be this Cinco de Mayo with kiddos in tow. The sprawling Arroyo Grande vineyard and farm will play host to live music, lawn games, and munchies provided Fire and Wine Food Truck this May 6. The tasting room is casual with a nearby picnic ground area perfect for hanging with the whole clan (fur babies welcome). Castoro Cellars in Paso Robles not only has a welcoming tasting room and breezy, shaded patio but also grape juice tasting, lawn games and cheese platters for the kiddos to enjoy. Swing by this unpretentious tasting room, for an afternoon of local hospitality. Have teenagers? No problem! They&apos;ll love playing the 18-hole Whale Rock Disc Golf Course nestled between oak trees and the vineyard. Baileyana in Edna Valley is like something out of a storybook dream. Your kids will love to pose for pics outside the historic Independence Schoolhouse, built in 1909. The adults can taste a selection of wines chosen from 30 different white and red offerings across all five brands, including Tangent and True Myth wines. Browse an enticing shop stocked with gourmet foods and charming gifts everyone will want to claim as their own. Ample outdoor seating with views across vine, valley and mountains will enchant all ages. Bring your own picnic or pick up some gourmet cheese, salami and crackers right there at the tasting room. With two bocce ball courts onsite, the kids are welcome to busy themselves with a bit of friendly competition. That means all you have to do is sip and enjoy the old-timey ambiance. Nothing gets your creative juices flowing like a little liquid courage. 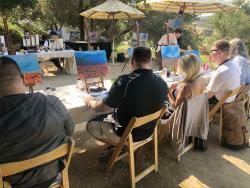 Many wineries offer Sip & Paint events where you&apos;ll be taught by a professional painter how to create a masterpiece all while enjoying the wineries top-notch wines. Looking for something a bit more adrenaline-inducing? Head over to Ancient Peaks and Margarita Adventures for wine tasting and a thrilling zipline adventure. Or, take one a wildlife hummer tour or kayak tour. Don’t stop here! Go forth and taste all the unique wine experiences for yourself. Many local wineries are offering special winemaker dinners, concerts tours, barrel tastings, and events nearly every weekend. Learn more about the diverse array of SLO CAL wineries and upcoming offerings now.